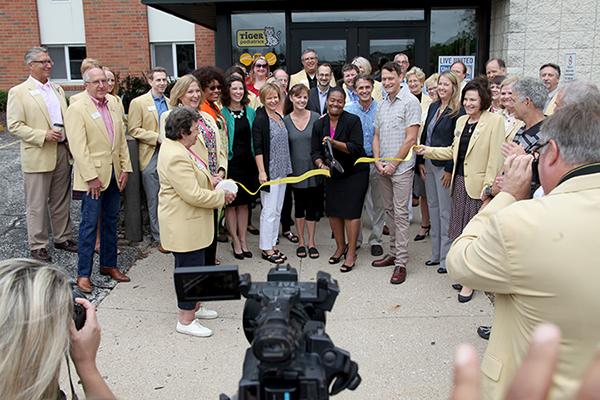 The Columbia Chamber of Commerce hosted a ribbon cutting for FACE on Aug. 15. 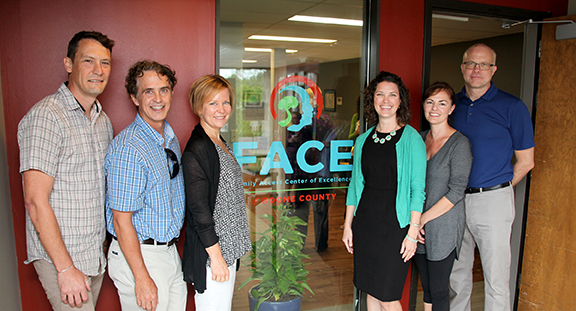 The Family Access Center for Excellence (FACE) initiative opened its doors on Aug. 15 as a unique collaboration to offer the citizens of Boone County one-stop access to quality mental and behavioral health services. FACE brings together University of Missouri researchers, including faculty members from the MU College of Education, the Missouri Prevention Center, Boone County schools, law enforcement, juvenile court, public health and community services departments. The “single entry” concept is believed to be the only kind in the nation. The goal of FACE is to improve access and coordination of services for families and to proactively address disproportionate minority contact with the juvenile justice system. If families are aware a child is experiencing challenges—the current system offers no single entry point and families often feel confused as to how to access the right services. Other concerns such as cost and transportation present barriers to service access as well. Families also struggle with what to do after their initial appointment. FACE will address these concerns by offering family and youth-focused assessments, case management, and professional support to address these common barriers. Mizzou faculty members involved with FACE include, left to right: Aaron Thompson, School of Social Work; Keith Herman, ESCP at the College of Education; Kristin Hawley, Psychological Sciences; Kelly Schieltz, ESCP at the College of Education; Wendy Reinke, ESCP at the College of Education; Clark Peters, School of Social Work. Erin Reynolds, executive director of FACE, says staff will help families determine an “action plan” that works for the child and his/her family and will offer options for additional services. Services may include child abuse prevention, substance abuse programs, temporary shelter for youth, respite care for parents of children with mental illnesses and psychological services. Larger-scale public health initiatives may improve access to services; however, they may not improve family functioning. She says that the FACE program is aimed at improving services from the ground level—including support for local social service agencies and providers in the form of training and technical assistance to implement evidence-based practices and programs. According to MU researchers, no reliable data exists on the number of underinsured or uninsured families in Boone County. However, FACE, a $4.1M project funded for 3 years by the Boone County Children’s Services Board, will monitor families and provide data to Boone County government offices to develop a system that more accurately estimate that number and monitor the success of investments in social programs across the county. One indicator of success will be to reduce the number of children referred to the juvenile court system.